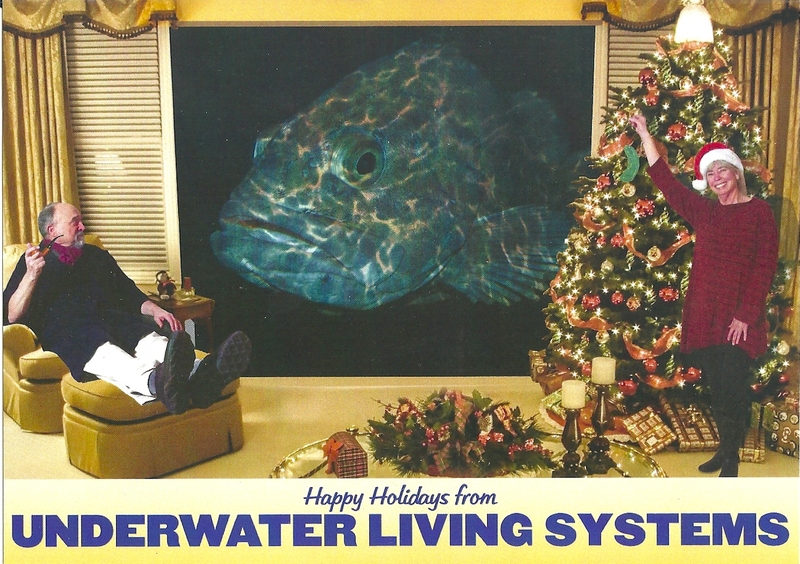 December 28, 2014 - The inclusion of a pipe-bedecked David Stafford in the holiday card he sent me this year puts me in a mood for a bit of puffery as well as the obligatory, profuse and predictable gushing thanks you have come to expect. Conservatively, the mail-art network has existed for 50 years. Anyone with a little knowledge of the history can usually cite someone else who already did it (and better) when something seemingly new appears. David Stafford might well be the exception. I venture to place him as a top satirist working in the network today and strikingly original with few to no precedents. In these cards, David Stafford has managed to present a searing commentary on the commercialization of the holidays and the artificiality of bourgeois customs. His use of surrealism and the absurd are evident and masterful. For one thing, New Mexico is associated with the desert, not oceans. 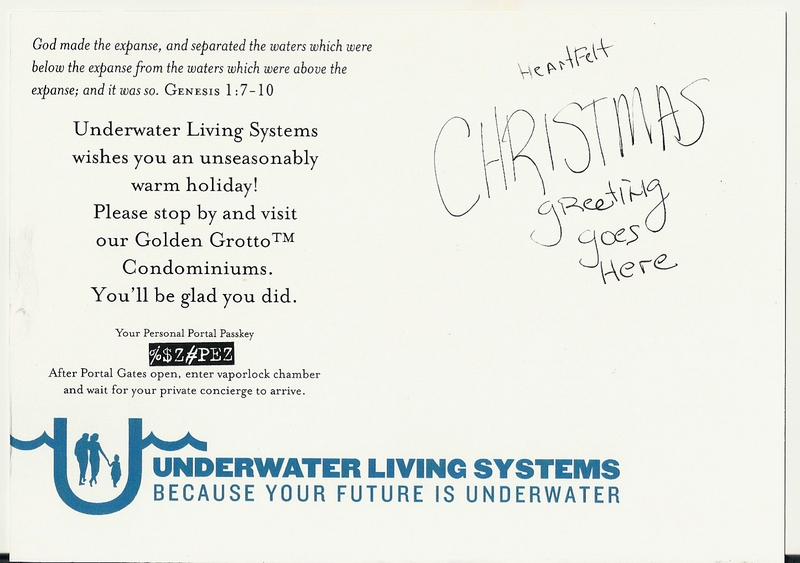 The commentary on the condominiums is extremely subtle and clever: “Underwater” is also a terms for real estate investments gone bad in the wake of the economic disaster that began in the USA in 2008. 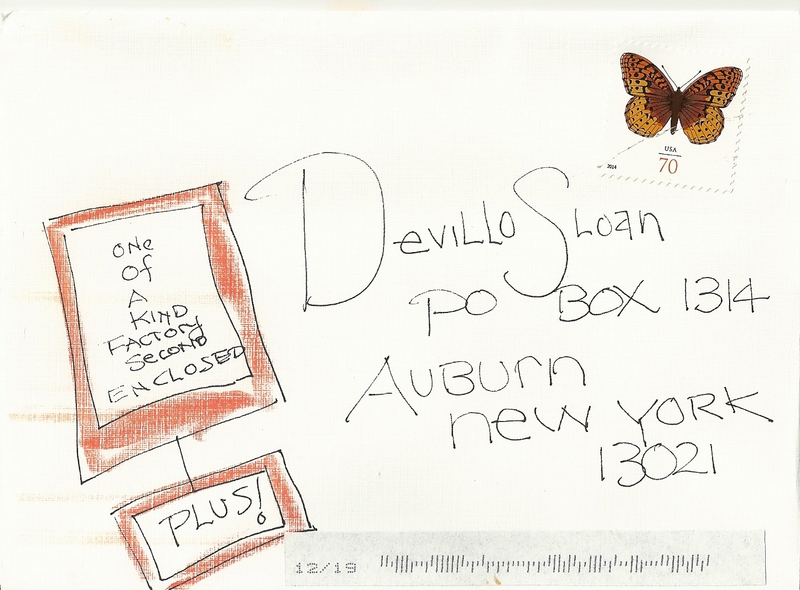 Many thanks to David Stafford for another outstanding year of mail art. This is just what we needed, DVS. The common core has been remiss in leaving out the vital role satire plays in our society. I'm not sure I should interrupt this discussion. It's kind of fascinating. Probably the best way to see this card is as a continuation of my concerns about climate change and the people who somehow think they and their descendants will escape the consequences because, for the moment, they have the means to avoid them. For a more complete look at what I've been up to see this. As it turns out I am a big fan of 20,000 Leagues and Richard Hamilton and the piece that Richard C. mentions is a favorite pop art piece of mine. It's an evergreen commentary on consumerism and advertising. The blonde model is not paid but receives royalties if I should ever go viral. Of course, I'm not one to assume that just because I generated this I should have the last word on its meaning. We'll definitely add that one to the list of interpretations, BG. I saw another sci-fi piece by David Stafford that puts Carina Granlund in the future (2054, I think) digging holes in the ice. Might be related to this. David is not so much Captain Nemo as Captain Emo. I can read it as a pun on "living in a fish bowl." That could reveal some paranoia, the feeling of being spied upon or surveillance. I wonder if that blonde model gets paid for appearing in these productions. My take on it was that when the earth heats up, the ice melts and everyone will live under the sea. 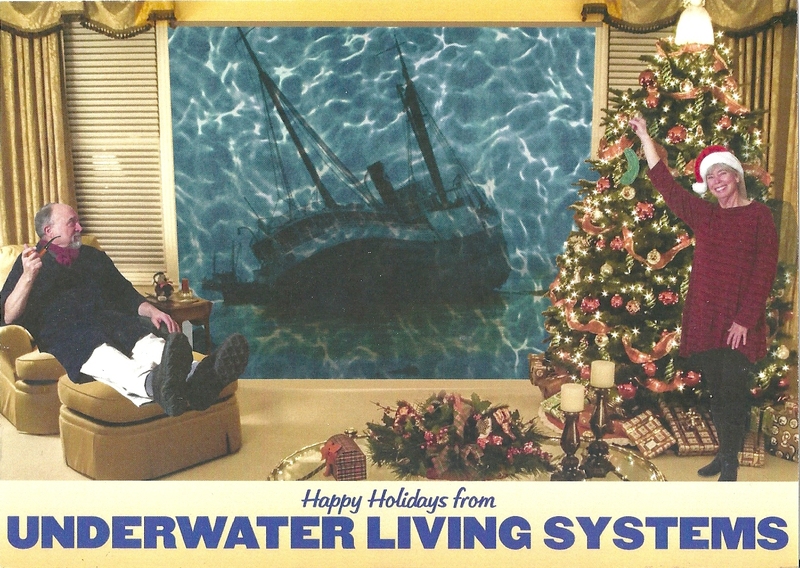 It is the best xmas card I have received since I got the drawing of Santa getting his tongue stuck on a frozen ranch gate (not by David, but another satirical customer unrelated to these pages). Thanks, Richard. I had debated whether to add yet another paragraph to the blog concerning the layers of references and associations - the ambiguity - in David's work. His work, the real attraction here, would have been buried in text and I refrained. So I appreciate the insights you (Richard) added because I did have more to say. In fact, I did have a section where I wrote about how I thought you and RCBz in Minnesota might rank as current reigning satirists some where a few notches below David because both you and RCBz have other artistic concerns as well. David, the "factory second" on the envelope explains it all. It is great to have different versions. The piece also bears a striking resemblance to classic shots from "20,000 Leagues Under the Sea." So I guess it's David "Captain Nemo" Stafford. 28.12.14 Dare De Villo S., ....this satirical stuff from David Stafford (& supported by biblical text no less) looks like pretty deep hot water to me & way over my head....While I do find it to be a most pleasant representation of a 21st century domestic holiday bliss, it does also, somehow remind me of still yet another lovely classical work of art from another time... I refer to the British Pop artist Richard Hamilton & his "Just what is it that makes today's homes so different. So appealing?" .... & a HNY!!!! Richard C.